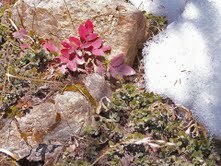 White elk, blue bird, green shoots--these are the miracles that have filled the last week for me. This is the point upon the seasonal Wheel-of-the-Year when I expect miracles. White elk, blue bird, green shoots—these are miracles of the “Super” in the natural world that I have been celebrating all week. For several years I had been hearing stories of a female white elk from hunters, hikers and wilderness wanderers. She was first seen one summer up Paradise Divide. During last year’s autumn Hunting Season she was viewed through a rifle site with a large herd gathered for the mating rut in Dark Canyon. She was not quite a legend yet. Perhaps, she is merely a forest fable. The ice on the rivers is breaking up. The snow is crusting and compacting from the sun-melt. There are even occasional patches of glutinous, glorious, earth-smelling mud. It IS the beginning of Spring in the Rockies, the time known to us two-leggeds as MUD Season. I see a band of elk, possibly all cow elk who have traveled down from the high tundra and dark timber to prepare for the calving season. As if it is not enough that these tender ungulates are near starvation with the scarcity of grazing and the demanding journey from the high mountain wintering grounds, but now they must make ready to birth their young. I pull the truck over and figure how far the elk are from any open lane or trail. Not far as the crow flies, but a good distance over a stark white plain, five feet of snow and willow and cottonwood breaks along the Taylor River. I do not have my snowshoes. I don’t even have decent boots or gloves. I am on my way to my counseling office in the “big city” of Gunnison. And I am determined to scan this herd for what the Ute Indians called White Elk Woman. I pull over where, hopefully, I will not get stuck in the mire of ice and muck. Slowly, tentatively I step up onto the sun-encrusted snow. If I can spread and balance my weight just right I might be able to walk on top of the snow. Otherwise, I will be sinking into three or four feet of icy, unforgiving slush. This is the kind of crust that cuts coyotes’, foxes’ and dogs’ paws. It’s not hard to get stalled in the cement-like snow, gripped and floundering like cow in a sinkhole. After a few tentative steps I am gently sliding, almost skating across the crust. It’s like what I imagine a Rocky Mtn. Jesus might experience while walking on water. I am exhilarated! The herd is just ahead of me, all but the sentinel elk lying down in the early morning sun. As the guardian elk turns her head in my direction, suddenly, a mirage appears in the center of the herd. She stands up slowly, unfolding herself the way a camel might in the midst of a gleaming mirage. She is stark white, indecipherable from the snow except for a delicately freckled dun and beige “saddle” in the center of her back. This is the only way I could separate her from the stark reflection of the snow-bed the herd has created. She turns her pure-white head toward me, and barks, once, sharply. The rest of the sunning, sleepy, herd rouses itself. They stand, turn in my direction, and pull rank, circling around the white elk. I marvel at the possibility that they know she is unique, and in any other season, an endangered target and ultimate prey. They surround her like the petals of flower closing around its calyx, an oyster closing its shell around a pearl. I realize that she is not an albino. She could not live through the high altitude sun of summer or the intense reflection of sun off of snow in the Colorado winters. She IS somehow, successfully, sacredly what the Ute elders spoke of in their pilgrimages north to this valley. She iswakan, sacred, in the cosmology and mythology of Plains and Mountain Native nations. She is set apart, dedicated to the prophetic and healing—glowing and precious in the nature of life and spirit. I give thanks for this privilege. I leave a tobacco offering and slip my way across the supernatural snow. Nearly blinded by the sun on my path I look upward along the tree line to get perspective from the shadows. There, flitting and swooping across my line of vision I see what looks like a fragment of the wildly blue sky. It is the first Mountain Blue Bird! Dull and uninteresting much of the time, only when the sun catches the iridescence of her wing feathers does the blue bird (literally) SHINE! As she darts in her zigzag pattern across the fence line and into a rancher’s pasture I see that she is carrying dried grass in her beak. Generously, many of the fence posts sprout birdhouses, which are the domestic havens of the shy and seasonal bluebird. If you have lived in the Rockies for enough winters you learn to honor the sighting of the First Blue Bird as the ultimate statement of True Spring.Warmed by the sun, and heartened by my walk-on-(frozen)-water experience I head down the ranch lane to look for any sign of green. I know I will be late for a clinical staffing meeting, but this is so very much more important. I see various detritus revealed by the receding snow: a hunter’s tin ammo box, a beautiful gnarled piece of drift wood, some raven’s feathers, the pelvis-bone of a deer. And then, just at the receding southern edge of a boulder-field, I see the first blast of green! 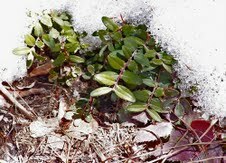 Newly forming shiny leaves reach out of their snowy nursery. They are reaching, reaching toward the sun! This is the best present I could receive! Today is my birthday. It is also a time in which I expect miracles. White Elk, Blue Bird, Green Shoots. I am truly blessed. So. As we celebrate the Vernal Equinox, World Water Day, Earth Hour, Passover, Eostra’s feast and Easter I am celebrating an entire Birth-Season. It is agreed among my friends and family that I may claim as mine own, the period from March 21 to the Summer Solstice (when my partner Mark’s Birth Season begins.) It is agreed because I insist. Because I do not wait for people to remember my birthday, or to make me a party. I do not stand on modesty, diffidence or even pride when it comes to reminding folks of my great fortune to be born at the time of the Northern Hemisphere’s Springing Forth and Re-Birthing. I do not wait for people to remember my birthday, because Nature does such an exquisite job. The sap is rising, the heart is launching, and Spirit is on the wing. Happy Spring.